President Juncker's European Fund for Strategic Investments (EFSI) has produced an update on its progress to date. The update is a lovely piece of work, with elegant graphics and breakdowns of projects and investments by country and by sector. Really impressive. Kudos to the content management team. However, exactly how much is being invested in each country, and on what, is buried in country-specific documents. So I've tabulated it here. Obviously, it's incomplete. For about half the countries in this list, there is NO information. Well, this is awkward. Fortunately, help is at hand. A calculator, in fact. The totals show that the EFSI has actually invested more than this, so the remainder is presumably going into cross-country projects and investments. 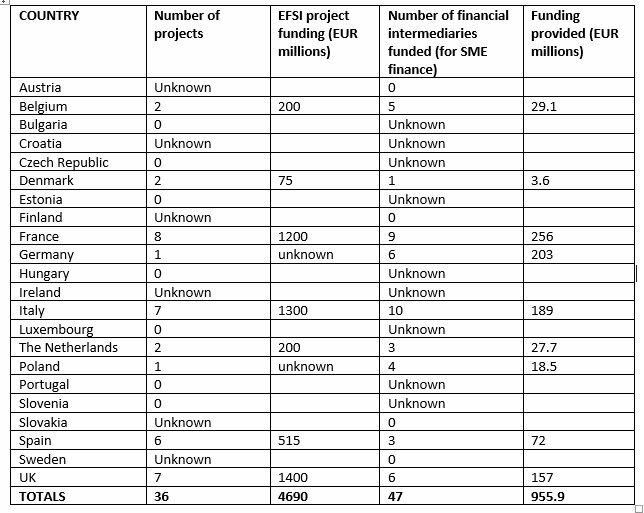 There is (I assume) just over 1bn Euros going into cross-country projects and a further 1.2bn (approx) going into cross-border SME financing via unspecified financial intermediaries. Fair enough, but this is hardly comprehensive or transparent information, is it? The cross-country project in question is an infrastructure fund in France & Belgium which is described as an "equity fund investing in transforming former industrial sites into uncontaminated and habitable areas". It has no funds allocated to it yet. 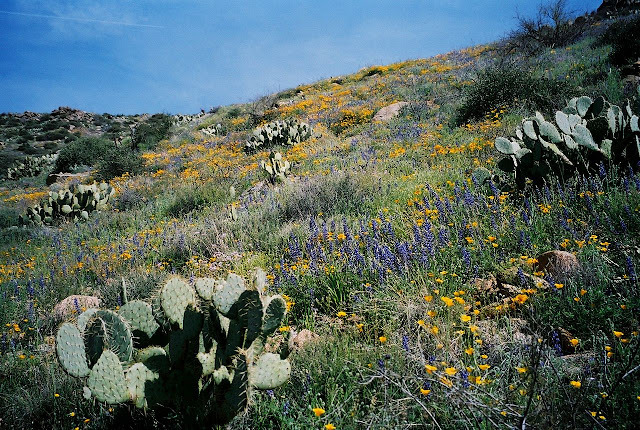 But this is the ONLY project identified as cross-border. 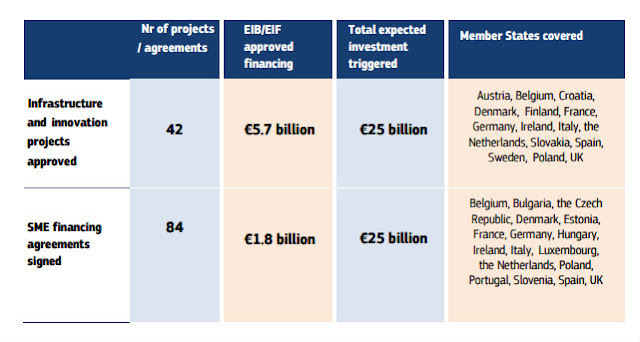 So where on earth 1bn EUR supposedly invested in cross-border projects is actually going remains a mystery. I was going to tabulate the projects by sector and cross-reference them to their countries. But I gave up when I discovered that construction of a bio-tech mill in Finland was listed under both Agriculture and Circular Economy. No doubt there are other examples of double counting, too. To be fair, the State of Play document does say that some projects are multi-sector. But the innocent could be forgiven for thinking that these were two separate projects. I think they call this obfuscation. 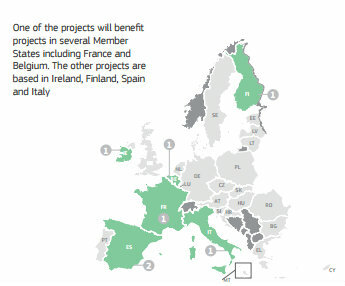 In the first months of 2016, the regional groups established to oversee the implementation of the Projects of Common Interest (PCIs) will discuss eligible projects that the EFSI could help finance. 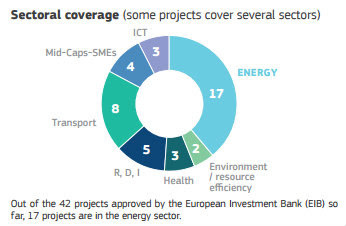 The EU budget for 2014-2020 already increased the energy sector allocation and the EFSI should complement it to give EU consumers access to secure, sustainable and competitive energy. 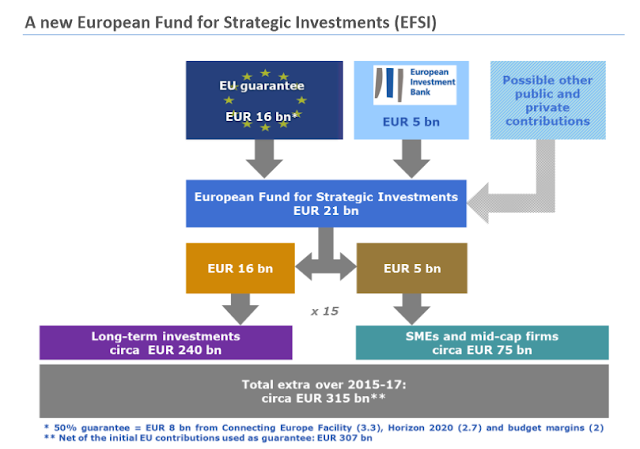 The EFSI can be combined with other sources of funding in the EU budget for particular projects and platforms, in particular Connecting Europe Facility (CEF) financing (both grants and financial instruments) and European Structural and Investment Funds (ESIF). The effectiveness of the EFSI could benefit from the combination of financial instruments, EIB loans and grants in a "blending approach". So the EFSI, which already has 3.3bn EUR of capital diverted from the CER, proposes raiding it again. This isn't "new" investment at all, is it? I seriously doubt if there is much financing of genuinely new projects going on. I think that EU governments have simply seized on this initiative to reduce the impact on their own budgets of already-planned infrastructure investment. For example, one of the projects financed is the UK's Smart Meter rollout programme. But the UK government has been planning this for years. The rollout would have gone ahead without EFSI funding. Kudos to the UK government for its opportunism, but providing funding to rich countries for infrastructure developments that they were intending to do anyway is surely not the point of this initiative. But whether or not there are genuinely new projects involved, the financing is pitiful anyway. Spain's total capital investment (including capital for SME investment) is 597m EUR, which is supposed to result in 1.6bn EUR in project financing and 731m EUR in financing to SMEs, a total of 2.331bn EUR. That is about 0.2% of Spain's GDP, and most of it is expected to come from the private sector. It is hardly going to make a significant difference to Spain's fortunes - especially if much of this is simply refinancing existing projects. Nor is the money going where it is needed. For example, most people acknowledge that Germany is desperately in need of investment, and very reluctant to do it because of its fondness for trade and fiscal surpluses. You would think that Germany would have put out lots of applications for project funding under this initiative, wouldn't you? Not a bit of it. There is only ONE project application from Germany, and that isn't for actual infrastructure development - it is for a "renewable finance guarantee", which is described as a "risk-sharing facility for loans to renewable energy projects in Germany and France". True, Germany has received 203m EUR in funding for SME investment - the public development bank KfW has benefited from this, among others. But Germany has a massive capital surplus which it exports all over Europe. Why, in heaven's name, is this scheme providing capital to German financial institutions to support investment in SMEs? I am, frankly, underwhelmed by this piece of marketing spin. Admittedly it is early days yet, but the combination of pitiful results with typical EU fudge and obfuscation does not bode well for the future. At present, Wolfgang Munchau's prediction that the Juncker fund would not revive the Eurozone appears all too likely to come true. We cannot afford to maintain the present infrastructure. Throwing 50p into the gas meter. I think there was 500million or more wasted on Irish water meters and counting. The waste involved is simply epic. 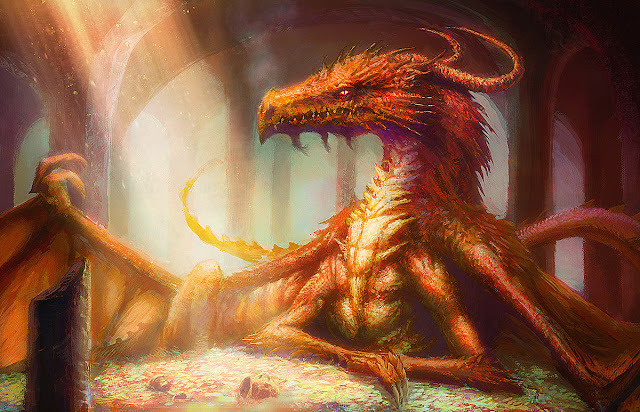 Only people somehow connected to their peasant past can somehow understand this through basic grounded commonsense. Many have become propagandised by typical euro green lies. They are anything but green. Adding to pointless growth / work. Peasantry do not do waste. All effort is for end use real human consumption. God knows what it is today.
" The fundamental assumption of the orthodox conception is that the production of goods and services automatically distributes sufficient money in the form of incomes to meet the costs and hence prices of goods and services. 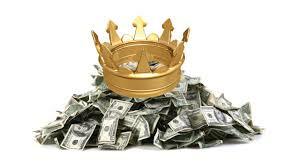 This state of affairs is sometimes referred to as Say's law (after the 18th century French economist Jean-Baptiste Say): supply creates its own demand, or, in financial terms, the flow of prices is automatically balanced by the flow of effective demand in the form of incomes. On this view, if, in a given period economic period, a certain volume of production is going unsold, it is because people are saving their incomes instead of spending them. Douglas' great contribution to economics was his discovery that under modern industrialized conditions the basic assumption of economic orthodoxy is false. Say's law does not hold; i.e., the circular flow is NOT characterized by an automatic and endogenous equilibrium. Instead, the flow of consumer prices is greater than the flow of incomes that are distributed in the course of the corresponding production. There is, in other words, a chronic and inherent deficiency of consumer buying power"
Robin fighting the forces of darkness and usury . In some respects nothing much has changed these past 1000 years.